Let’s just assume you’re a successful small business owner. Sales are consistent, and over the years, you’ve built individual relationships with all your loyal customers. This is totally great, and something we should all work towards. Now, here comes the next question. 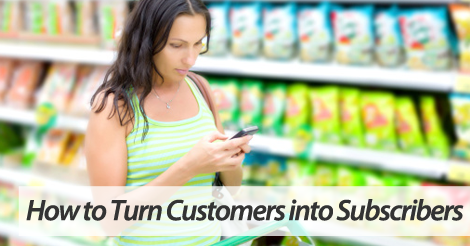 How do you take these loyal customers, and turn them into SMS marketing subscribers? First things first, let’s make sure SMS marketing fits the media habits of your regular shoppers. Now, don’t bother gathering intense statistics, but just use some common sense. More often than not, do your customers carry around a mobile device? If your answer was “yes”, then SMS marketing is definitely a solution for you. Now, here comes the crucial next step. Considering you have such a valuable rapport with your customers, don’t be afraid to engage in a one on one verbal invitation. Before doing so, make sure you understand the details behind your SMS marketing list. Know the answers to the following questions. What will customers receive in exchange for opting in? Do you understand the basics of SMS marketing compliance, and how to send campaigns that follow these guidelines? How will you offer continual value to these loyal subscribers? Finally, above all else, make sure you can clearly explain opt in instructions. Failure to do so will easily result in a missed opportunity to connect. Partner up with one of the top SMS marketing companies, SlickText.com. Give us a buzz today at 1.800.688.6290 to learn more, or head over to the pricing page and sign up for a free plan. If phone calls just aren’t your thing, that’s totally cool. Shoot us an email at info@slicktext.com, and our rockstar support team will gladly walk you through the sign up process. Our feature rich platform is packed to the brim with educational resources that help you, the SMS marketing beginner, conquer this mobile communication method.